You may wonder how did he make himself a pair of bionic hands when he actually doesn’t have hands. Well, he just did it. 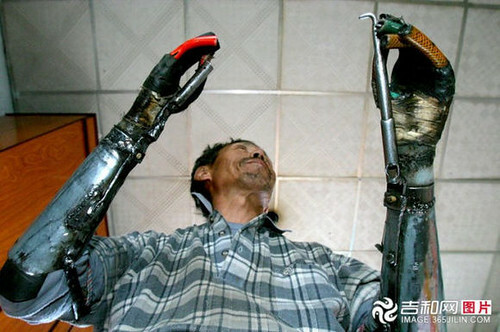 He named Sun Jifa, a 51-year-old Chinese man who lost both hands when he was building a bomb for blast fishing. Since the prosthetic limbs would cost a fortune, he decided to build a new pair of arms. Sun spent 8 years rigorous efforts, he finally created himself a pair of bionic hands which can grip and hold things, and that’s what we are going to show you after the break. The bionic hands are made by scrap metal like wires and pulleys, which make the hands quite heavy. Sun said each hand weighs around 0.9kg, and he has already get used to it. Also, the pair of hands can easily get hot or cold in the extremes of summer and winter. There’re hooks on both of his bionic hands, but they’re not for self defense. The hooks are to clasp the holes on equipment like farming tools, so Sun can lift those heavy tools up without breaking his bionic hands. The hook is removable, Sun can take them down whenever he wants to. Without the hook, the movement of the hands is controlled by using his elbows. For example, when his elbow moves forward, his palm will open. He now plans to improve the design and built it for other similarly disabled people. We salute to his perseverance!